More than meets the nose. 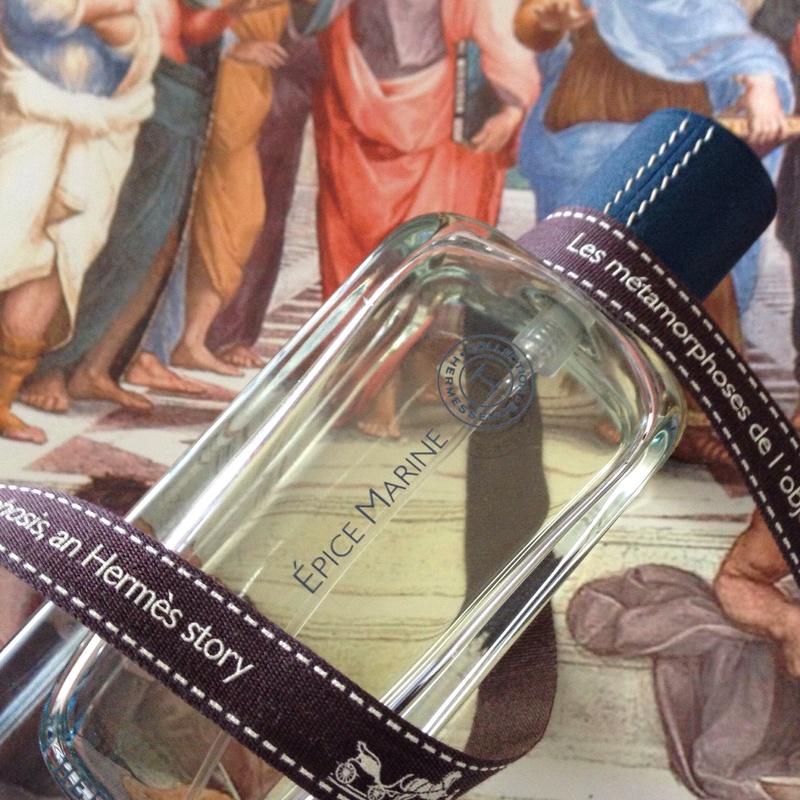 A solid offering from the Hermessence line by Jean-Claude Ellena. Once again, I cannot speak from experience – I seem just a bit too young to recall any serious fads in fragrance and I can merely read up on previous events. In the mid 90’s it was all about the ‘aquatic’ and funnily enough now in 2014 we have the Oud obsession. ‘Aquatic’ sprouts much unneeded fear and trepidation in the hearts and noses of many fragrances fanatics and connoisseurs all around the world. I just missed the early to mid 1990’s rage for L’Eau D’issey, CK One and Acqua Di Gio – So I guess I consider myself blessed, or something like that. The colognes/EdTs laden with citruses, watery notes and calone with the distinct scent of melon and sweet fruit turned from something supposedly new age, vibrant and rejuvenating to a rather offensive waft of fragrance impetuously worn and sprayed on without consideration of others. There’s a sickly sweetness from the aromatic aquatics that sets it apart from citrusy colognes, making it invariably overbearing upon an overly generous application. Whilst the inescapable goal of aquatics is to smell like… well to smell like sea and salt water (duh): being all blue, salty, green, mossy, driftwood-y, seaweed-y and all that jazz, it is also important to keep those notes down to a minimum. The goal for a fragrance to smell predominately like sun-touched skin from a Mediterranean sun, a towel-dried body with a fine layer of sea salt or just plainly the ocean can often be a little quixotic or just unrealistic. I feel that shouldn’t be focal point in this style of fragrance, but merely an idea to improve upon; and I’ll even say it myself – even nature is imperfect or more enigmatic than what you once may have thought. Épice Marine is… I guess a specific sort of aquatic. It would be unfair to call Épice Marine an aquatic because I cannot detect any melon or tropical fruit vibe at all in the mix, so the framework for the typical aquatic is not fulfilled – nevertheless this merely contains a smidgen of calone, the default aquatic note. It opens freshly, vibrant and awakening. It has two distinct features from the opening few moments: It delivers a beautiful briny punch of bergamot and orange freshly picked and squeezed with the warm gourmand hit of toasty cumin and cardamon. Only the slightest aspect of cumin’s sweaty character is revealed and the bittersweet pungency floats along in the opening already rejecting the aquatic model. If you smell sternly a beautiful honey-hazelnut whisky note comes through with all of the complexity still attached. The facets of wet wood, charred casks, sweet grass and peat all make an appearance ultimately making you swoon and shiver in rapturous pleasure. Considering this, this is exactly what you can expect from a collaboration between the master impressionist Jean-Claude Ellena and the three Michelin starred spice king Olivier Roellinger. The inspiration for this fragrance is steered in a direction stemming from mutual respect for each other’s craft and the olfactic delights each entail. Born from an encounter in Cancale, Brittany, the admiration for what the location contains ultimately lead to this fragrance. The aroma of the sea, the meddling tones of blue and grey in the sky and on the shore with the nasal perception of spice (èpice); the cold sea almost contradicting the warm spice transported by the pirate trade with the intriguing smell of rope, rotting wood, sand and shingle fusing together to create a deep, storytelling fragrance of adventure, trade and time. Anywho, I am certain there is a virtually innumerable amount of rare and exotic spices in the mix and rightly so. The sweet roundness of cardamon and the woody roasted character of hazelnut deviates from some of the grassiness of the vetiver in the blend. The smell of toasted sesame seeds adds a level of comfort whilst the merest amount of oakmoss provides depth and realism. So I guess, by the term ‘aquatic’ you wanted to provoke the smell of the sea, evoke the grit of sand and pebbled shorelines and the scent of sweet brine and wave smashed wooden ships then this is the best you can get. Alternatives: Declaration by Cartier; Neroli Portofino by Tom Ford (It evokes an entirely different riviera/sea scent); Costa Azzura by Tom Ford; Voyage d’Hermès by Hermès; and Acqua Di Gio by Giorgio Armani. I’m going to label Ellena ‘Master Teleporter’. Smell and you shall see why – this time we go to a cold and grey sea shore. This entry was posted in Hermès and tagged Epice Marine, fragrance review, Hermes, JCE, Jean-Claude Ellena, salty, sea, Spice. Bookmark the permalink. Fantastic Review! I love it! Fantastic article, Liam! I too missed the ‘aquatic’ fad of the mid 90’s, but nonetheless I do know the tropical vibe you describe. The vibe that Épice Marine is lacking, separating it from your more typical aquatics. Once again, brilliant review! !